I attended a tasting event this past Wednesday at Classé Catering in Albany. I was part of a contigent of food bloggers who were invited to sample the wares of Classé’s newest venture, Big KaHoona BBQ. They brought us in to taste their menu items in advance of their launch party on June 16 (yikes, tomorrow!) at the Pruyn House in Latham. I was in great company that day – Daniel B. from the FUSSYlittleBLOG, Rachel from The Crispy Cook, and Jessica from 518BitesandSights (they all posted reviews on their blogs, too). Plus Daniel brought the adorable Little Miss Fussy along – she’s just so darn cute, and really not that fussy, actually. "CERTIFIED ANGUS BEEF BRISKET, Seasoned with our signature rub and slow smoked for 12 hours"
BRISKET: Nicely trimmed of fat, and was moist and tender. Not quite tender enough to cut with a fork (should it be? I don’t know), but not at all tough. 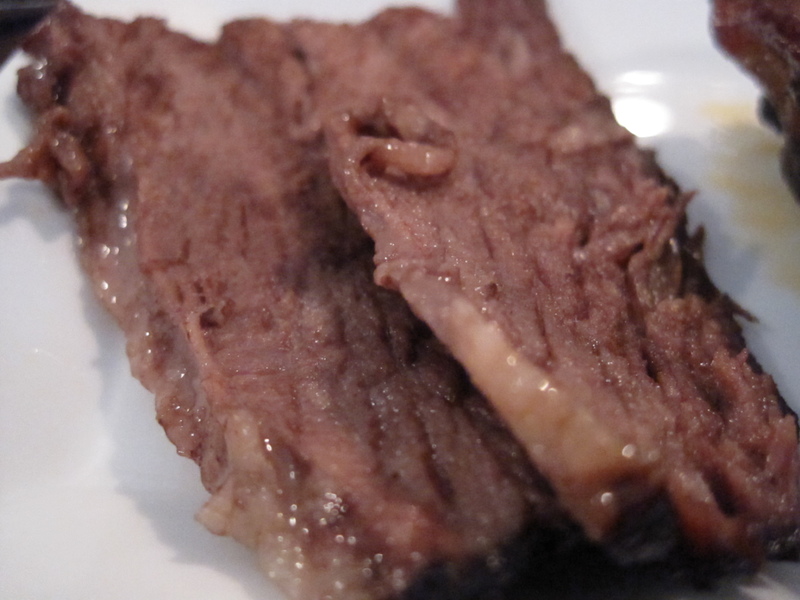 It was smoked for 7 hours, which gave it a rich and…well, smoky flavor that I really enjoyed. The lengthy 24-hour brine gave the meat a terrific juiciness. What I learned: not everyone loves their brisket trimmed as much as this one was. Some prefer a thick layer of fat, melting into and flavoring the meat. Not me. I’m always on a diet, so the less fat the better in my opinion. 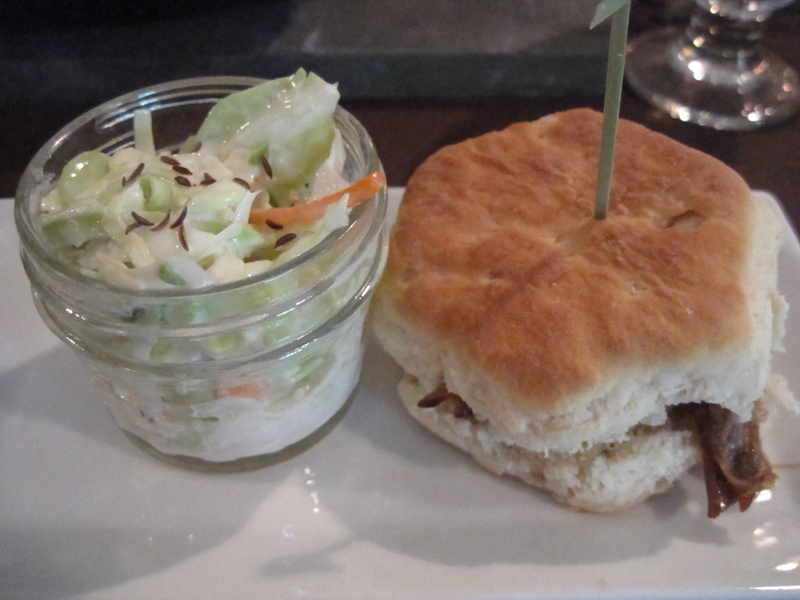 PULLED PORK and COLESLAW: Two barbecue items that can be my absolute favorite things. This coleslaw was definitely done well – not overly dressed in mayonnaise, with a nice tang from the cider vinegar. I thought the addition of a sprinkle of caraway seeds was brilliant – absolutely the right flavor. The pulled pork was very good, but very unlike other pulled pork sandwiches I’ve had around here. Much of the time, the pork is swimming in a gloopy, cloyingly sweet barbecue sauce, and served on a squishy soggy bun. Not this one. 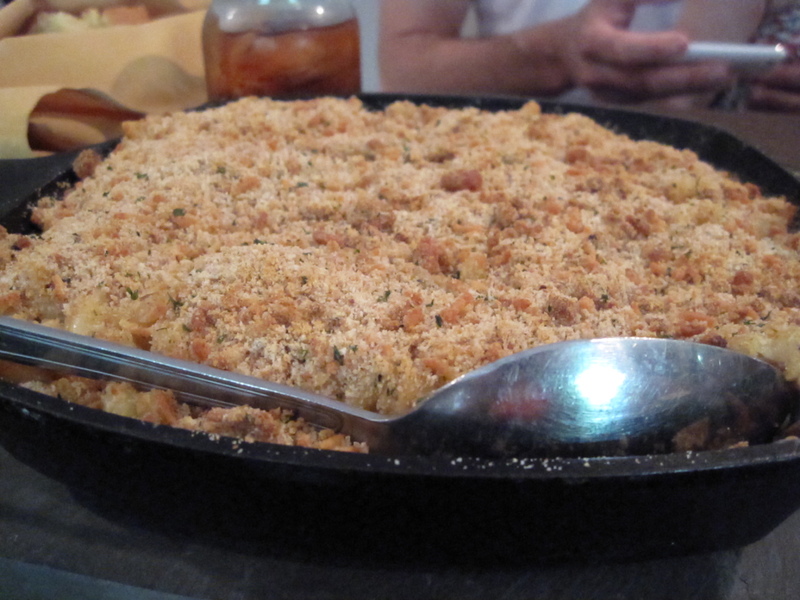 The meat was dressed lightly in a sharp, tangy vinegar-based sauce (Carolina style) that was not sweet. The drawback to this particular dish was the biscuit it was served on. The biscuit itself was tasty, but a bit too crumbly to stand up as a sandwich container. BABY BACK RIBS: I must be honest, I did not even know what I was looking for here. I’m not really a fan of ribs, so mine is a very amateur impression. 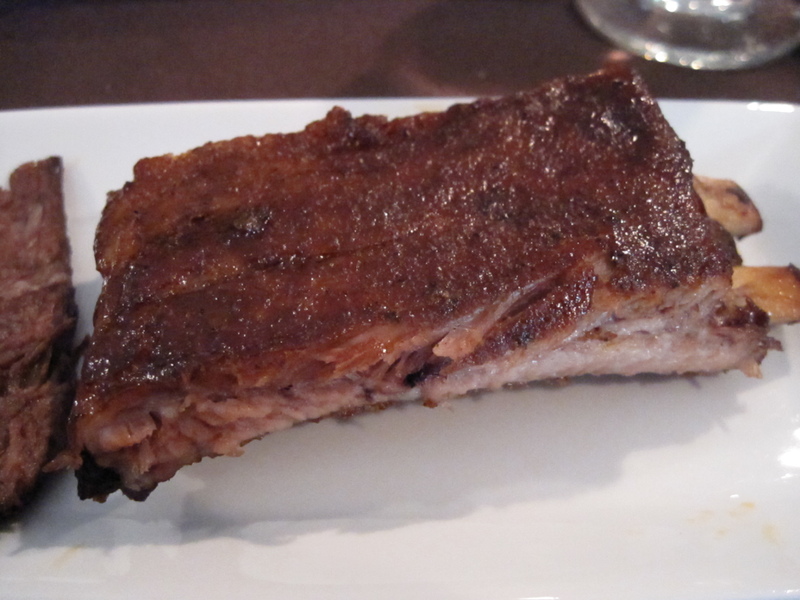 The crust on the ribs was crisp and sweet, with a hearty helping of smoke. The ribs were not fall-off-the-bone tender, but according to my sources (Daniel), they shouldn’t be. So, a point here. If you like ribs, you will probably enjoy these. MAC AND CHEESE: This offering was inspired by Chef Kane’s grandmother’s recipe. I love me some mac and cheese. And there was much about this version to love: it was filled with traditional and comforting elbow macaroni, topped with crispy buttered breadcrumbs, and studded throughout with smoky burnt ends of brisket. The thing that was missing was cheese – there just wasn’t enough. They didn’t miss the mark by a lot, but the addition of a few more handfuls of Vermont cheddar would have sent this dish over the top. 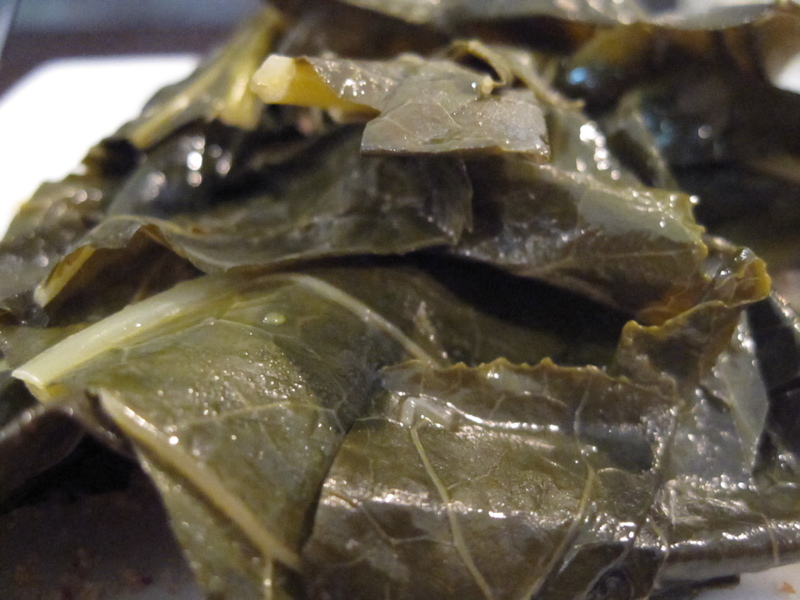 COLLARD GREENS: I tried collard greens for the first time a couple years ago at the legendary Hattie’s in Saratoga Springs. I was immediately entranced by their earthy green-ness, which was offset by a smoky spiciness, which I guessed was from nutmeg. I saw Chef Jasper walking by, and asked him what he put in the collards. He said nothing. I’m pretty sure he was lying, because I have yet to find collard greens as good as Jasper’s. Chef Kane’s are pretty good, though. They’re a bit on the crunchy side, which is great – mushy greens are awful. These were seasoned sparingly, taking most of their flavor from a ham hock and some cider vinegar. The real flavor of the greens shone through. I could eat a whole plate of these. 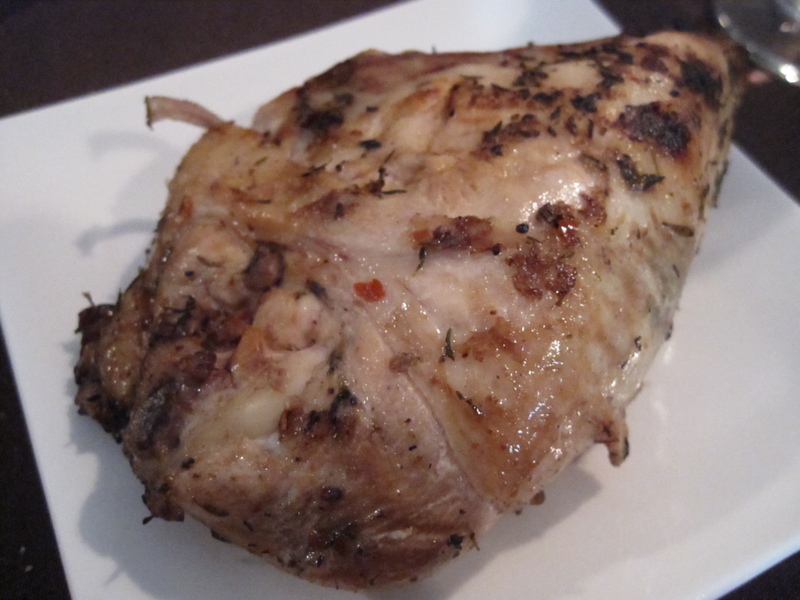 JAMAICAN JERK CHICKEN: It was good chicken, but it wasn’t jerk-y enough. The meat was cooked perfectly, with a nice juiciness. But I was hoping for a more aggressive spice – jerk spices are best when they’re right in your face, letting you know what you’re missing because you’re here and Jamaica is all the way down there, with people having fun and drinking Red Stripe without you. This chicken lacked that punch, and also lacked a crispy, almost-burnt skin that you come to expect from a grill. Chef acknowledged that he was also disappointed in the soggy skin, and noted that it won’t be the case in the future. BAKED BEANS: Just ok. Pretty standard, barbecue sauce with some bacon pieces. SKILLET CORNBREAD: The menu promised jalapenos, but I didn’t taste any in there. Which is fine. The crumb was dense and moist, and it was not overly sweet. Delicious. SAUCES: Four varieties – House Barbecue, Peach Jalapeno, Chipotle Mango, and Dr. Pepper Barbecue, all made in-house from scratch. The only one that I didn’t really care for was the Chipotle Mango. I thought the consistency was too thick, and there wasn’t enough chipotle flavor. The other sauces were fantastic, but the Dr. Pepper sauce really won the day. Everyone was raving. Chef Kane told us that the recipe was created by his teenage nephew, who convinced his uncle and Classé Catering to bottle it for him. They plan to start selling it soon at the Troy Farmers Market. Chef Kane was incredibly gracious, accepting our compliments and discussing our criticisms with both professionalism and candor. It was nice to know that he was really listening, and taking our comments seriously. I got the sense that he really has a desire to do the very best he can to create delicious food. I would have no problem recommending Big KaHoona BBQ to anyone looking to have a terrific barbecue, for any type of event. Many thanks to the accomodating and helpful team at Classé Catering for opening their doors to me and my fellow bloggers! We should do this again soon. How’s next week? Previous Previous post: Upper Union Street Strawberry Fest Returns on June 18! Those ribs actually were not baby backs. That is a different part of the rib cage closer to the loin. These were spare ribs as they had the rib tips still attached, which were those fatty ends that were full of bonus cartilage. As much as it pained me, I was suggesting to Chef Kane that he use a St. Louis cut that does away with those delicious tips in the service of providing a less messy (and more refined) barbecue eating experience. Oh, and much of what passes for pulled pork is an abomination. I loathe meat swimming in sticky sweet sauces. And too much pulled pork is just braised pork shoulder in an awful, insipid sauce. However, the cheap white bun is still my preferred delivery device, because it doesn’t get in the way of the meat. This is why I was happy you were there. Thanks for the corrections. I wouldn’t know a baby back from a humpback. Well that,s nice, I wonder why they’d do that? I’d say it was smart of them to reach out to food bloggers. Some of us have a lot of regular readers. We were in no way obligated to write about the experience. Thank God you were not too emphatic about the free-food experience then. I disclosed it was free. I gave an honest and fair review, I thought. I would recommend them – I thought the food was good. I won’t apologize for not throwing the food on the floor in disgust, as you are implying would be the correct course of action. Yes, and when my friends invite me to a dinner party I’m not obligated to bring food or a drink. But it’s expected. This event, and by extension you (and all the other bloggers who participated), are all a part of their marketing campaign. I’m not trying to bash here, just pointing out the dinosaur in the room. You’re right. It was definitely part of their marketing campaign, which I completely understood going in, and made sure to mention right at the top. I didn’t think I was hiding anything, and mea culpa if it was not clear enough. And no, nobody is trolling you, I shared this article in Google Reader because this is an issue that S and I care about. We both have opinions on the local blog community, specifically local food bloggers, and more specifically the interplay of bloggers and businesses influencing each other. This is entirely separate from Lisa Barone’s own debacle. I think if you were to be really honest about the situation, you would say something like “Big KaHoona invited me and other food bloggers to a free tasting with the hopes that we would write about it so they’d get some advertising”. It’s hard for me not to think you knew this going in, Jessica who joined you was a bit more open in saying “my job as a food blogger was to taste & comment (& of course blog)”. Your comment about not being obligated then seems a bit disingenuous. The real question is this: you received something of monetary value (food) at no cost, with the expectation that you would talk about it on your blog. How is that fundamentally different from accepting direct payment for advertising for a business in a blog post? You might say well, I’m honest about my opinion of the food, but the fact is that by simply not having to pay for it you can’t evaluate in the same way that any of us who do have to pay for it would. I’m not singling you out here, I’ve noted this on Daniel’s blog too. But in my opinion, you can’t handwave the ethical question away just by saying “full disclosure”. Also, don’t forget that your Twitter streams right alongside your blog, yes we can read what you say about us “behind our back”. You actually bring up a very good point, which upon going back and reading your prior comments on Daniel’s blog, I remember agreeing with. Getting a gift does alter the experience in most instances. It likely won’t change your opinion of me or of my review, but let me just say this: this was the first time I’ve ever received anything through writing this blog, and I’ve learned many things as a result. One of them is that I’ll never be able to please everyone, no matter how positive or negative my opinion. I write this blog for fun, not for free stuff or for profit. No worries, I have you in my RSS feed and I’m going to remove that over this or anything 🙂 Glad you understand where I’m coming from, whether you agree or not (I think my opinion is probably in the minority; then again, most people like getting free stuff). Hope I didn’t come across as too harsh. Happy eating!